For a restaurant owner planning their Thanksgiving menu, the drink options can be just as important as the meal itself. You will of course want to offer the standard beverages such as water and soda, but it is also a great idea to include some festive holiday drinks. One of the most popular drinks during the holiday season is apple cider and the good news is that there are plenty of different ways to use this popular drink. Apple cider drinks include both hot and cold beverages, as well as alcoholic and non-alcoholic ones; this means that there are plenty of drink options for customers of all ages. Here are some of the most popular cider recipes that will complement your Thanksgiving menu. 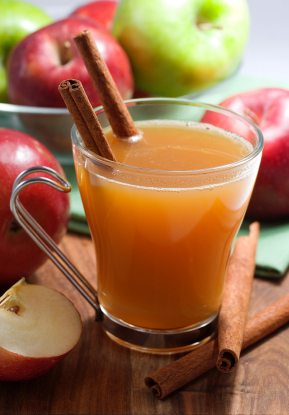 One of the best options, great for all ages, is classic hot apple cider. This drink goes well with any holiday food, making it ideal for dinner or dessert. It is also one of the simplest cider drinks to make. You will only need apple juice, cinnamon, nutmeg and optional cinnamon sticks (for garnish). For a variation, try serving hot spiced cider instead of this classic cider, by simply adding some cloves. If you want to try a cold version of cider that doesn’t just taste like apples, then ginger-cider lemonade can be a great option that will intrigue your customers. All you will need is water, sugar, fresh ginger, lemons and apple cider. This is great for all ages as it is alcohol free. For a variation on the classic hot apple cider, you can add some raspberries to the apple and make a hot raspberry cider. All you need to do is mix apple cider or apple juice, frozen raspberry juice, sugar and cinnamon sticks and then heat it up. The fall flavors of this drink should complement any Thanksgiving food just as well as the classic drink will. Serving Thanksgiving dinner at your restaurant is all about pleasing the customer and nothing will make families happier than seeing their children happy. One of the things kids like best is feeling grown up and this sparkling cider is a great way to achieve that goal. All you need to do is mix some sparkling apple cider with orange juice, tangerine juice and grenadine and you will have a delicious cider drink that will not only complement the food, but will also make the children in your restaurant feel mature. If you will be serving a large Thanksgiving dinner at your restaurant, it is ideal to make a large quantity of drinks at once to save time and that is what is so great about this punch recipe. All you have to do is heat up some sugar, water and a cheesecloth with ginger, cinnamon sticks and cloves. Refrigerate the mixture then add some orange juice, cider and lemon juice. Right before the meal, heat it all up on a medium low flame and your warm punch will be ready for customers of all ages to enjoy. If you are looking to add a cold cider drink option for adults, then hard cider sangria is a great option. Because it is cool, you can make it ahead in bulk which will make serving it at Thanksgiving dinner much easier. To make a medium punch bowl, just mix a cup of sliced apples, a sliced orange, a cup of apple juice, 1/4 cup of apple brandy, 22 ounces of hard apple cider and 2 tablespoons of fresh lemon juice (increase the proportions accordingly). Another adult cider recipe that will go well with any of the traditional Thanksgiving dishes is cider hot toddy. Just mix apple cider with cranberry juice cocktail, tequila and either orange-flavored liquor or triple sec. Just be sure to add the alcohol after heating up the drink. If you want to add a bit more holiday flavor to the drink you can add nutmeg, allspice, cloves and cinnamon sticks. Another adult version of the classic hot apple cider is alcoholic hot buttered cider (you can also leave out the alcohol and make this drink great for all ages). Just mix apple cider (or juice), brown sugar, cinnamon, allspice, cloves, lemon peel, butter, thin slices of apple and rum. The trick is to add the butter after serving out each portion of the drink.